When a new season begins, many of us start thinking about updating our wardrobes and interiors. Some choose to add new accessories in the living room and refresh the linens in the bedroom and bathroom. Other people might feel the need for a complete overhaul. If you are considering a new kitchen, Magnet has something to suit every taste and budget, the brand new 2016 styles are perfect for the warmer months. Pastel colours are synonymous with summer and if there was ever a time to incorporate them into the home, it would be this season. Lustrous deep cream cabinets and beautiful Nebraska Oak worktops are wonderfully complemented by soft pink walls in the new Apollo Cashmere kitchen. The wood of the units and Classic Oak Natural flooring give the room a warm feel that will take it through to colder seasons too. 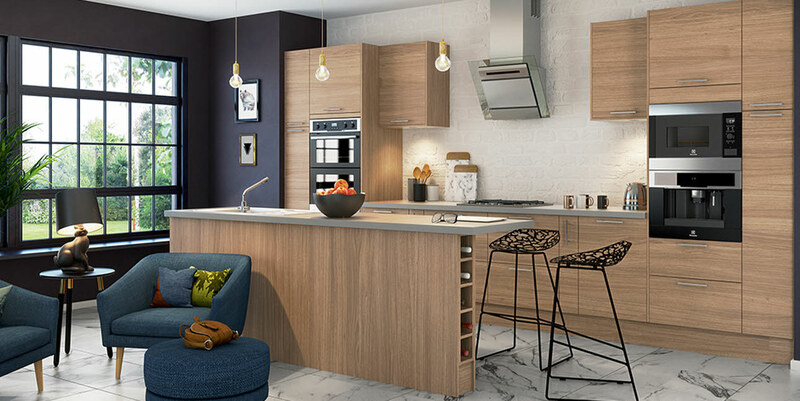 The new Integra Alpine Oak is refreshingly simple for the summer months and the lighter grain of the units is so versatile that you can match it with almost any colour. Neutrals will bring the light into the kitchen and help achieve that airy feel, or go for bold to get a summer look that is unique to you. The textured cabinets are free from handles, helping everything in this contemporary kitchen flow nice and smoothly. For a kitchen to team with the botanical trends of SS16, Winchester Grey looks unique when paired with a pine green feature wall. The industrial mid-grey palette may not feel immediately summery but when topped with oak timber worktops and paired with green, brings a feeling of the outdoors inside. The sleek, stylish kitchen has a classic edge with the wood grain effect shaker doors.